Wonder why all the swiss roll must be rolled into round shape since it is invented. Dare to be different, I creatively roll it into TRIANGLE shape without any triangle mold's help. I admit that it is extremely difficult which makes the unsatisfactory result. Lesson learnt: I should use the butter cream or icing sugar to coat the swiss roll surface. It makes my swiss roll full of my finger prints (melted due to the weather) when I'm trying to cut it into slices. Anyhow, delighted with this first attempt - triangle shape of swiss roll, at least something different and unique. Interesting fact: Swiss roll is not origin from Switzerland even it sounds alike. 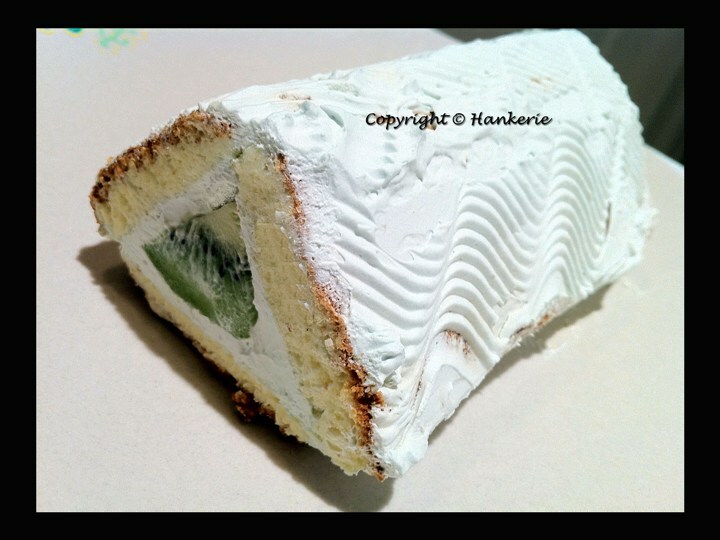 "A Swiss roll or jelly roll is a type of sponge cake roll. The thin cake is made of eggs, flour and sugar and baked in a very shallow rectangular baking tray, called a sheet pan. The cake is removed from the pan and spread with jam or buttercream, rolled up, and served in circular slices. The origins of the term "Swiss" roll are unclear and the cake originated in Central Europe and not Switzerland. It is a traditional German, Hungarian and probably Austrian type of cake. The shape of the Swiss roll has inspired usage of the term as a descriptive term in other fields, such as in optics." 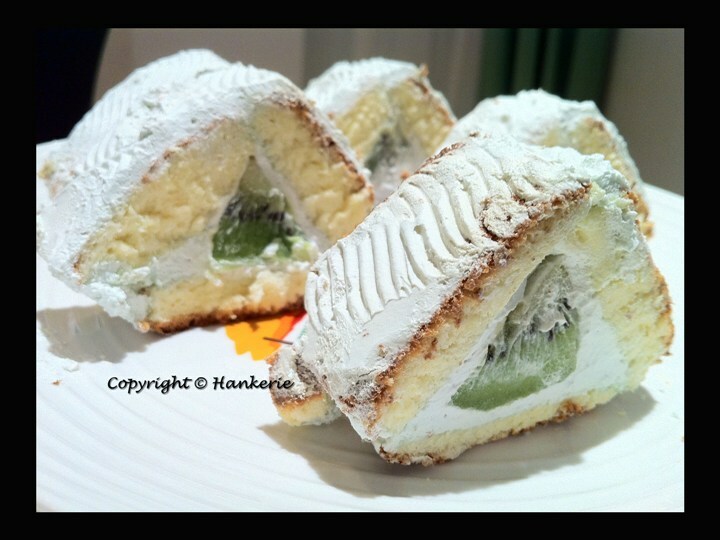 Sorry for the rough look of my swiss roll below (I know it is not perfect), anyhow this swiss roll taste delicious, perhaps it is due to the freshness of kiwi fruit combination.